This month, Nexight Group has been particularly busy with facilitation at 10 separate facilitated meetings. Although Ross and I have facilitated more than 300 meetings and workshops during our careers, every facilitation we conduct requires careful planning, thoughtful design, and attention to detail. 49% of workers consider unfocused meetings and projects to be the biggest workplace time waster and the primary reason for unproductive workdays. Executives average 23 hours per week in meetings where 7.8 hours of the 23 are unnecessary and poorly run. Nexight Group has developed a two-day course that teaches clients how to facilitate meetings that get results. But we understand that not everyone has that kind of time to invest. 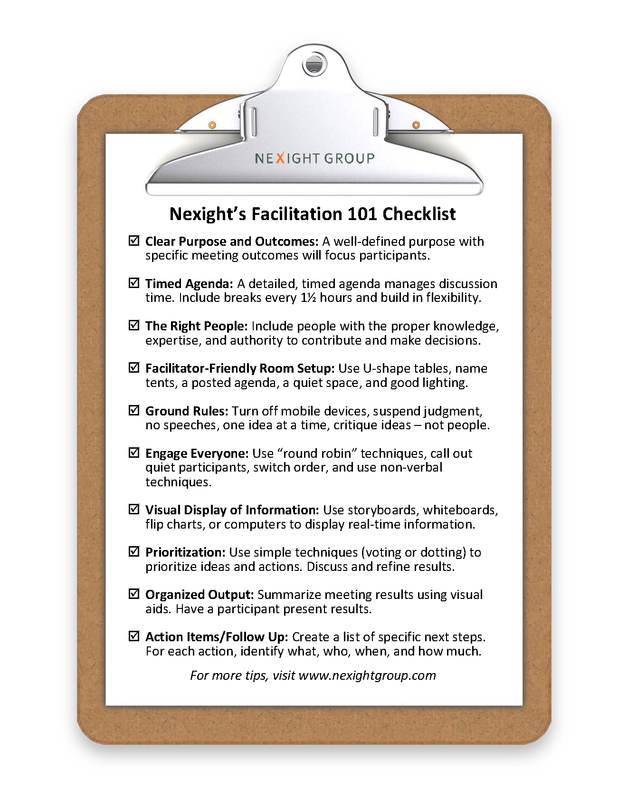 So, we developed the Nexight Facilitation 101 Checklist with 10 essential elements for a successful facilitated meeting. Visit our Meeting Facilitation webpage to learn more.